A man spends his day knee deep in the Salmon River near Main Brook, Newfoundland fly fishing amongst the wilderness under the sunny sky. Surrounded by wilderness near the town of Main Brook, Newfoundland, a man casts his fly fishing line into the waters of the Salmon River. The river is fairly high and moves at a decent pace as it meanders its way around large boulders and is home to some of the best Atlantic Salmon around the Newfoundland region. During the salmon run, which is usually at its best in the month of July, you can see salmon breaching all over the river, but trying to catch one on the end of your fly fishing line is a skill of its own. The rivers around Newfoundland, Canada have about ten to twelve thousand Atlantic Salmon that return every year which makes the population plentiful for every man and woman who partake in fly fishing. Until you learn all the proper techniques of fly fishing, be patient and hope that luck is on your side. Photo of a man fly fishing in the Salmon River near the town of Main Brook on the Northern Peninsula of Newfoundland, Canada. ... He has taken many courses in hunting and fishing over the years and is an expert in wilderness survival skills. 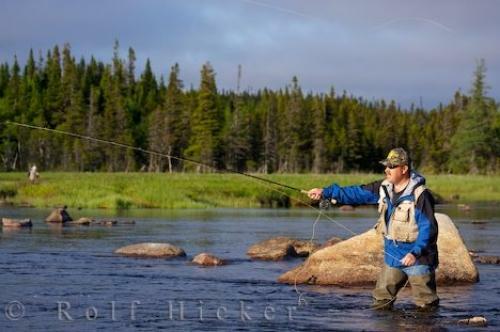 Proper gear is needed while standing in the Salmon River such as hip waders, boots and a proper fly fishing vest to keep your lures in.Fly fishing is becoming one of the more popular outdoor sports and many people that come to Main Brook, Newfoundland, book a fly fishing adventure. A guide takes to you the finer places along the Salmon River and teaches you the proper ways to cast your fly fishing line and how to reel it in if you get a salmon that has nibbled the end of your line. I photographed this photo with the digital SLR camera model Canon EOS-1Ds Mark II, aperture of f/6.3, exposure time of 1/640 sec. on ISO 200, as always I used a original Canon Lens, the focus lenght for this picture was 120mm.